The TsKB-15 single-seat fighter prototype was a diminutive low-wing monoplane of slim configuration, powered by an imported 626kW Hispano-Suiza 12Y inline engine. 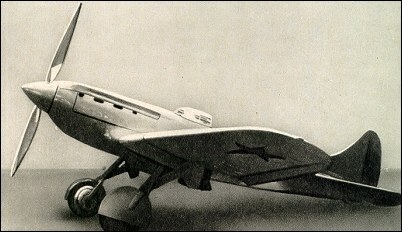 With an inward-retracting undercarriage, it flew in September 1934 and was followed by the TsKB-19 with the M-100 (Soviet version of the Hispano engine). Armament comprised a 20mm cannon and four 7.62mm machine-guns. Production of a small number as the I-17-2 was reported, but it is not known if the type was used by first-line units. A third prototype (the TsKB-33) had reduced armament in an attempt to cut down weight and increase performance. The projected use of this version as a parasite fighter to be launched from a multiengined 'mother ship' was subsequently abandoned. The huge fillet on the fuselage wing joint is likely to have caused unpleasant handling and contrary to appearances a lot of drag. This aircraft has sweet lines and looks like it would be fast and handle well. Why was it abandoned?